We woke up early in the morning to grab some breakfast pastries at Brauð & Co before heading out of Reykjavik. Honestly, the bread, I highly recommend. Throughout the rest of the trip we all interspersedly mentioned how we wished we bought more of the bread to munch on. Right across the street was Reykjavik Coffee Roasters. Janae got blessed with a free latte since the baristas accidentally made an extra! Free stuff always tastes better. Totally geared us up for our long day of adventuring! I was honestly really excited to finally get out of the city and see all the nature-y sights. I had been so antsy to get out there for so long and today was finally the day! When we first drove out of the city, the first they we saw were blankets of snow. White fluffs over fields, white mounts over the mountains, it was gorgeous. After a short 40 minute drive, we arrived at the Reykjadalur hot springs! Granted it was also half covered in snow, but the areas where steam rose up and areas where the warm water was still running, grass was already starting to grow green! The water was a crazy blue, which I cant understand. It must be the minerals or something, because it all looked like we were standing on another planet. Now, let's take a moment to appreciate these gorgeous windswept beauties. All along the road are those famous Icelandic horses you've seen and heard so much about. Honestly, I've had many conversations with people where we pine after the hair of these guys. Natural balayage and they don't even know it! They are honestly really gentle and friendly, and we loved interacting with them. Sometimes they get into a bit of a pickle with each other when fighting over food, but they loved letting us pet them! We then hopped on over to the Seljavallalaug Pool, which is supposedly "secret" since its hidden within the mountains, but is definitely gaining popularity! That's why when we got to the pool and only two people were swimming in it, we kind of tilted our heads in confusion. We came over all suited up in our swim suits (under our mounds of jackets of course), only to find that the waters were not quite as warm as we expected, so we didn't get in, but it was gorgeous to look at. Although technically is wasn't freezing, it veered more on the lukewarm side of things. Maybe it'll be more pleasant to dip in during the summer! 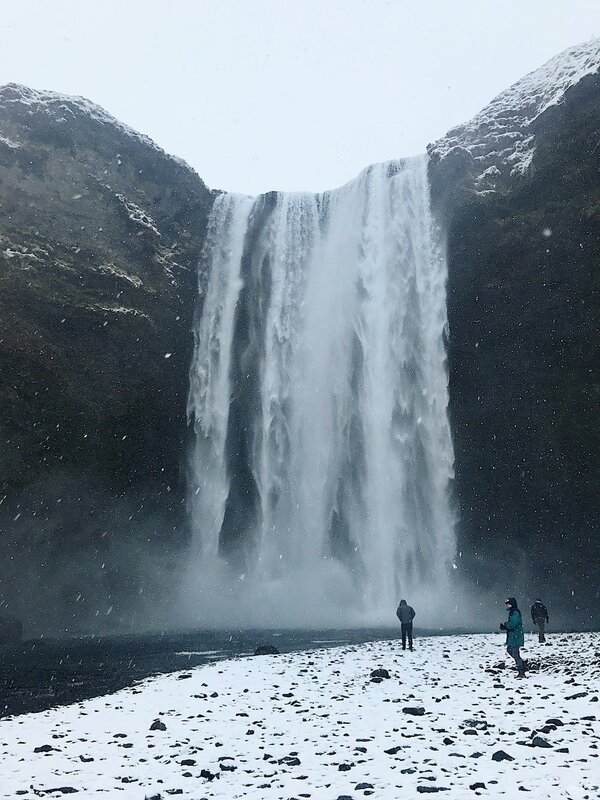 We then pulled on our waterproof pants and walked to Seljalandsfoss waterfall. The most unique feature about this waterfall is that you can walk all the way behind it, into this little cave!We got pretty wet because not only does the path behind the waterfall get you decently sprinkled with water, it was also snowing pretty hard just in general while we were at that location. Rain (more like snow) or shine though, this waterfall was probably one of my favorites throughout the southern coast of Iceland. We got so wet but honestly, it was so worth it. 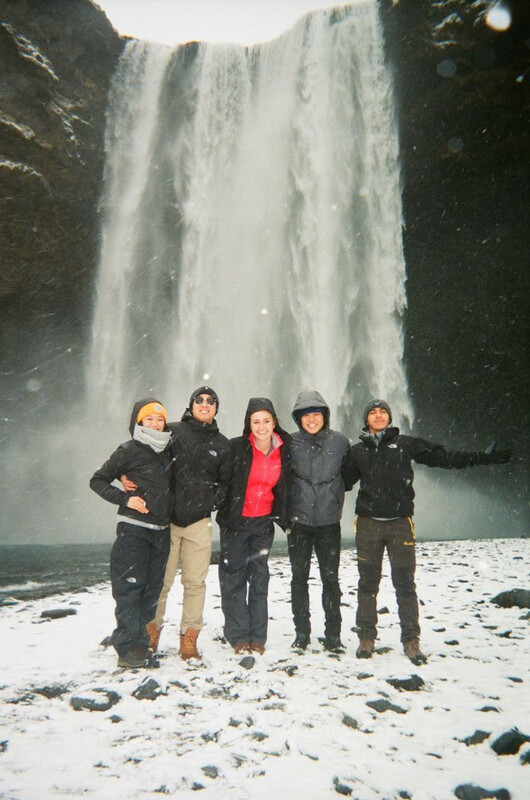 Lastly, even though we were all overwhelmed by the snow, we ventured out to Skogafoss! I didn't bring my camera out to here because the snow was falling even harder than before (maybe it wasn't that bad but this California sunshine girl couldn't really handle it), but I took some on my phone! This waterfall was pretty large and famous as well. It was pretty magnificent in beauty and size. We were definitely pretty exhausted by the end of the day though so I was pretty ready to go home to the Airbnb and stick my toes by the heater. Day two was a great success, but definitely was pooped after jamming so many things into one day. Kind of can't wait to see what Iceland is like without snow either!